The year 2010 was the 50th anniversary, Jubilee year for ZAOGA Forward in Faith Ministries International, and from August 20 to 22, 2010 was the weekend of the grand Jubilee celebrations which began in Bindura Zimbabwe, the birthplace of the ministry, and continued at the National Sports Stadium in Harare, the Capital city of Zimbabwe. 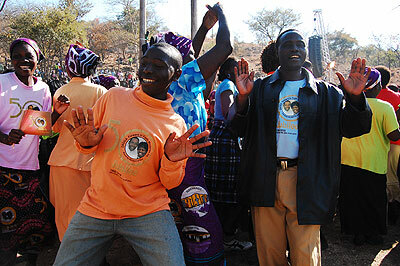 The Jubilee Celebrations began in Bindura, Zimbabwe, early in the morning on Friday, August 20th, 2010. There was already a large crowd that had gathered all night for a “Pungwe”, which is a Shona word describing an all night musical gathering where people celebrated together. Hundreds of people camped out, waiting for morning when the Jubilee celebrations would officially begin with the arrival of Apostles Dr. Ezekiel and Eunor Guti. The Friday morning service in Bindura, which is being described as the “sacred service,” was broadcast live on ZTV, the official national television network in Zimbabwe, as well as on Ezekiel TV, ZAOGA FIFMI's own television network, which streamed live on the FIFMI global website, www.fifmi.org. It was the first time in history, where the name of Jesus Christ was proclaimed live and simultaneously through multiple mediums, from Zimbabwe, into all the nations. 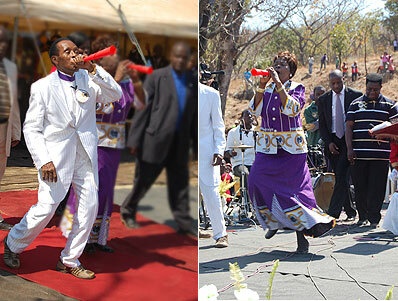 Before the services began, there was a Jubilee march in the city of Bindura, and Apostles Dr. Ezekiel and Eunor Guti went up to the sacred cave where God spoke to Dr. Guti many years ago concerning the ministry. The cave is located just uphill from the ZAOGA Cathedral on the same grounds in Bindura. Following the visit to the cave, the service began with music from the Jubilee Choir, as well as Pastor David Mabvuramiti, bringing excitement that was heard throughout the small town of Bindura. The atmosphere was overwhelming. At one point during the service, the electricity went out for nearly 15 minutes. However the incident became a blessing, as it was at this point that you could hear the sweet worship of thousands of saints, with no instruments, no microphones... just voices singing “you are faithful, oh Lord.” The voices filled the mountain where the crowd was standing, from the hills all the way to the bottom beneath the grounds where people were also standing. As Apostle Dr. E.H. Guti (Baba) stood up to preach he was accompanied onto the stage by Apostle Eunor, who blew her trumpet will such emotion and began to worship God. Baba began preaching, and spoke a simple message glorifying God for what had been achieved throughout the 50 years of ZAOGA FIFMI, and began calling sinners to repentance. As the service was ending, Baba pleaded with the people for more time, saying “Please give me chance I need to pray for my people.” He emphasized that there were some who came with friends and relatives that were living in sin, and requested their help to bring those people to be saved. Hundreds were saved that morning, with people also being delivered from demonic possessions and sicknesses. 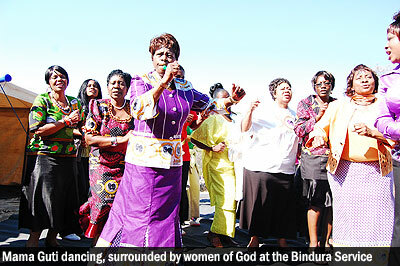 After the service, the downtown shopping area of Bindura was filled with people dressed in Jubilee attire. The small town was literally taken over, and it appeared as if “Jubilee” was now the local uniform for Bindura. The event was monumental and God's grace is continuing, as Apostle Dr. Ezekiel Guti emphasized that Jubilee would not end with the conference, but would continue until the end of the year. Read Parts 2 and 3 of this article.